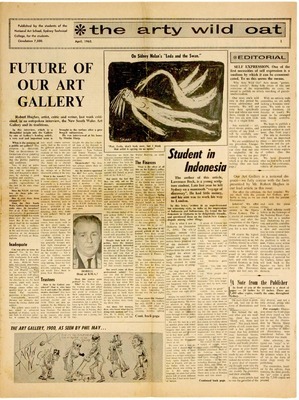 The Arty Wild Oat was a broadsheet student newpaper published in two editions during 1962 by students of the National Art School, Sydney Technical College. It was also a precursor to OZ magazine. The Arty Wild Oat was put together under the general editorship of Garry Shead, assisted by Martin Sharp along with Sue Wood, John Firth-Smith, Ernest Rushton, Ian van Wieringen and Robert J. Mayne. The Arty Wild Oat, published by the students of the National Art School, Sydney Technical College, Darlinghurst, April 1962, 4p. The Committee: Editor - Garry Shead, Assistant Editor - Martin Sharp, Pictorial Editor - John Firth-Smith, Women's Editor - Sue Woods, Advertising - Ernest Rushton, Circulation - Ian van Wieringen, Production - Robert J. Mayne. The Arty Wild Oat, Official Journal of the National Art Student's Club, National Art School, East Sydney Techncal College, Darlinghurst, July 1962, 4p. The Committee: Editors - Garry Shead and Martin Sharp, Secretary - Sue Woods, Art Editor - John Firth Smith, Production - R. J. Mayne.